On April 2, 2019, Private (Pvt.) Mark McBee was presented Badge #1 from Fire Chief Brian Byrd for being the most senior firefighter with nearly 35 years of service. Private McBee believes that he is the first African-American to receive this honor. Private McBee began his career with Toledo Fire and Rescue in May of 1984. In an interview with Pvt. McBee he responded that a friend of his suggested they take the civil service exam which he passed, as he also did with background checks and physical agility test. He was then selected to go to the Fire Academy. That year was the first one in which women were accepted into the academy and was also one of the largest minority classes. As McBee recalls, everything was new to him and he did not know what to expect. He commented that he enjoyed the camraderie of other fire fighters and they became more like family. The firefighters worked hard and played together and often supported each other through some of the tougher times of such as critical incidents. Private McBee said that if he could pass on anything to the new cadets it would be that they should work smarter not harder, serve the public well, be professional, do what you know is right. He recommends that they do not always follow the group, and to be your own person. Judge individuals yourself and not because the group says so. McBee is a Scott High School graduate and attended the University of Toledo. He has also been a Nationally Registered Paramedic for over 32 years. 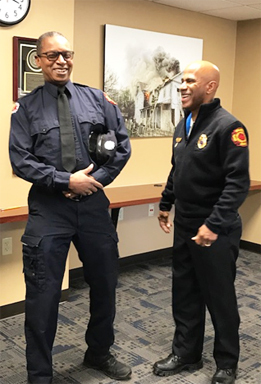 Firefighter McBee did not plan to serve as long as he did but he has no regrets “the many years went by quickly when you enjoy what you do” and in the coming months looks forward to his new journey. To my comrades thank you for all of your support and I wish you all safety and good health.